I’ve done the expat house hunting thing several times. In fact, I’ve calculated that since 2013 I’ve moved home ten times. When we (hopefully) move into our apartment here in Santiago, it’ll be home number 11. House hunting for expats has a few common threads (check rental prices before you jet off, do your research, be prepared to compromise…) but looking for a home is different in every city. Santiago is different to anywhere I’ve ever lived. I thought to list a few hints and tips I’ve picked up along the way to help any future expats who are moving to the city I now call home. Firstly you’ll need to consider where you’ll be happiest living. The more central districts of Vitacura, El Golf, Las Condes, Barrio Brasil and Providencia are highly popular. For a quieter, more suburban lifestyle, Lo Barnechea and La Dehesa are always in demand. All districts are very large however, so bear in mind that one side of town may differ a lot from the other side. Do your research, ask friends and colleagues, check Facebook (Discover Chile and Discover Chile: English Speaking Moms are useful groups to join for information). Smog. We arrived in the summer, but we’ve been warned that come winter time, a cloud of smog will descend upon Santiago. The only way to escape it is to run to the hills. Literally – the cleanest air can be found outside of the city where you’ll also find some lovely houses. Price. Needless to say, prices in the more central areas are higher and you get more bang for your buck the further you travel. There are some beautiful properties further out in La Dehesa, Lo Barnechea and if you are really prepared to travel, Chicurea. Schools. If you have children of a school age, it’s useful to know where they’ll be going to school first and find a home close by. This is in an ideal world. In reality, it takes ages for school admissions to be processed and it’s near impossible to know where you’ll find a space. While there are a few great schools in the Vitacura district, in my hunt I’ve found that most schools tend to orientate around Lo Barnechea and the surroundings. Driving. I’ve been warned that traffic can be hell at rush hour. If you’re coming from the suburbs to the centre for work (or play), be prepared for traffic jams. Or choose a more centrally located home. If you won’t have access to a car, or are not keen on driving, you may feel more comfortable in a more central area. Secondly you need to decide whether to choose a house or an apartment. We were originally looking for a house, but after spending some time in a temporary apartment in a quiet yet central part of town (Las Condes), we realised how great apartment living is for our situation. Amenities. Apartments generally come with amenities, such as a gym, pool, kids play area and a meeting room for parties. These are especially useful for families who need to entertain their kids for an hour before meal time without going too far. Community. It’s hard to say until you actually move in how tight a community network exists within the neighbourhood or apartment. Personally, I’m enjoying the apartment where we’re currently based as we’re always bumping into familiar faces and my three year old already has a long list of playmates. Security. Most apartments offer 24/7 security and if you’re on the 14th floor, it’s less likely that you’re going to get broken into by a passer by than if you rent a house. Furthermore, if you’re leaving country to visit family or friends then you can lock your apartment and go. If you’re renting a house, you’ll have to pay someone to house sit. Also, it’s less a danger than an annoyance, but you are much more likely to receive cold callers if you’re in a house. You won’t be pestered like this in an apartment. Neighbours. We’ve found our next door apartment neighbours to be incredibly forgiving of our noisy kids, but not all residents are as easy going. A house offers more privacy and quiet for sure. Size. Apartments over 140m2 are subject to additional land tax, meaning that larger apartments are not just more expensive, but also more scarce. Almost all modern apartments in the prime areas of El Golf / Las Condes etc are around 140m2. There are older buildings available up to 200m2 in size, but if you need more space, and value better fixtures and fittings, then a house in Vitacura or Providencia, or further out of town will be your best bet. Power cuts. I’ve heard on the grapevine that these can be a real issue for house dwellers. Garden. We were originally looking for a house instead of an apartment for this reason alone. To be able to open your back door to your whingey / overly energetic / screaming child and shout ‘run’, is a clear winner. 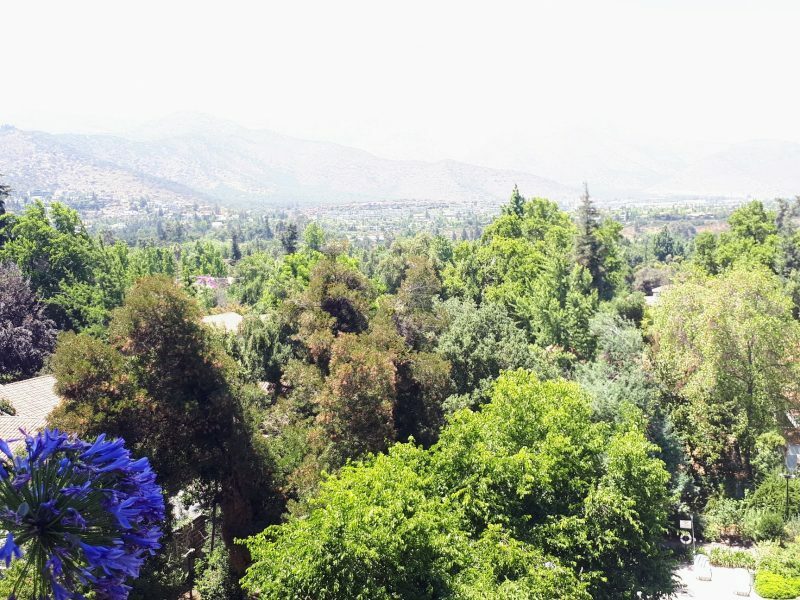 Gardens are also useful for sunbathing, al fresco dining, drying the laundry… Santiago has some fantastic green spaces, but hey you can’t take your damp sheets to the local park, can you? Some apartments do come with great terraces, but they won’t match a proper garden. There are a few ground floor apartments out there, but most blocks use this space for communal amenities as the ground floor is not considered as safe to live in as the upper stories. Look to the north. In Europe, we prioritise a southern view, but remember here in Chile, we’re on the other side of the equator so the opposite applies. For the best sun and shade, you’re going to want a northern or northeastern facing abode. Security. Does your home or apartment block include cameras, electric fences or secure walls? Chile is very safe compared to other countries, but crime is still rife, even in the most expensive parts of town. For me at least, as a newbie to the city with young children, security is a high priority. Children. If, like me, you have children, it’s worth asking the concierge (preferably when the realtor is not listening) about the ratio of children to adults and their ages. Keep the question open ended and ask other people living there too if possible. If you’re a young professional looking for some peace and quiet, or a family looking for fellow play dates, it’s useful to know the truth. Child safety. If you have young children, you should be especially cautious about safety issues. Apartment windows can be fitted with a highly effective plastic mesh which secures kids from falling out. Make sure all windows have been fitted with mesh no more than four years old, look for any signs of wear, or pay for it to be done before you move in. For houses with private pools, consider fencing off the area. Some pools already come fitted with designated alarms, or you can request these to be installed. Communal pools in apartment blocks should be fenced off already. For gardens, look for gentle slopes rather than steep steps. Traffic. When you’re looking round, open the windows. That calm apartment you fell in love with on Avenida Presidente Kennedy may not be so calm after all. In fact Avenida Pesidente Kennedy is apparently notorious for racing at night, so unless you enjoy falling asleep to the accompaniment of police and ambulance sirens, it might be best to look someone else. Running costs. Apartments typically come with communal fees from 200 – 400 million pesos per month. These fees will go up in winter time when the heating bills kick in. Some apartments come with centrally organised heating systems, others allow you to ‘pay as you go’. Some homes feature underfloor heating which is efficient, but at least with central heating the temperatures of each room can be modified. While houses may appear cheaper in the short term, factor in a potential gardener and pool guy, as well the higher winter heating costs and you may be surprised. Insulation. Santiago winters get cold I hear. Or rather, Santiago homes are not prepared for the winter. Look for double glazing, windows that close properly and good insulation. Some apartments feel much larger in size due to their terrace. Bear in mind, however, that when winter sets in you’ll no doubt have to stick to the indoors. Some terraces are closed off with windows, making them usable in the spring and autumnal months, however if they’re not double glazed then it’s unlikely you’ll get any use of this space in the winter. Negotiate. If you’re interested in a place, be prepared to negotiate. Negotiating in much of Europe can be complicated, in some countries it’s unheard of. Here in Chile, it’s de rigeur. Offer a price a little under what you’d expect to get away with, and be prepared to settle with a counter offer in between. You may not win, but it’s certainly acceptable practice and worth a try. Get your company in on the act. To aid negotiations or to secure the deal above other interested parties, it can help to mention where you work, how long your contract is for and your job title. Some landlords may ask your company to underwrite your contract, to act as a guarantor or for the whole process to be conducted through your HR department. Highlight your situation. If you have school age children, you’re pregnant, you have a long term work contract or you have a Chilean roots, mention it. Anything which shows you’re looking for a place for the longer term looks promising in the landlord’s eyes. And if you plan to stay just a year, don’t mention it. Most contracts are for one year anyway, renewable on an annual basis.